Staffing software is ideal for recruiters, corporate HR departments, and contract and temporary staffing companies. Staffing software provides companies with an easier way to identify a promising candidate more quickly. The success of search firms is dependent on automated recruiting software. StaffingSoft provides innovative staffing software to the employment industries. Our goal is to provide you with a better way to hire, manage and retain talented and qualified employees in a more effective, timely and cost-efficient manner. Our integrated software solution gives you the best functionality that you would expect from an Application Tracking system at an affordable price. StaffingSoft’s Staffing Software user interface is intuitive and feature-rich with a suite of online workflow managers that are designed around the way human resource and staffing professionals work to locate, recruit, and retain top talent. This software effectively integrates all aspects of the hiring process and increases productivity and the quality of hires, and reduces the time and cost to hire. 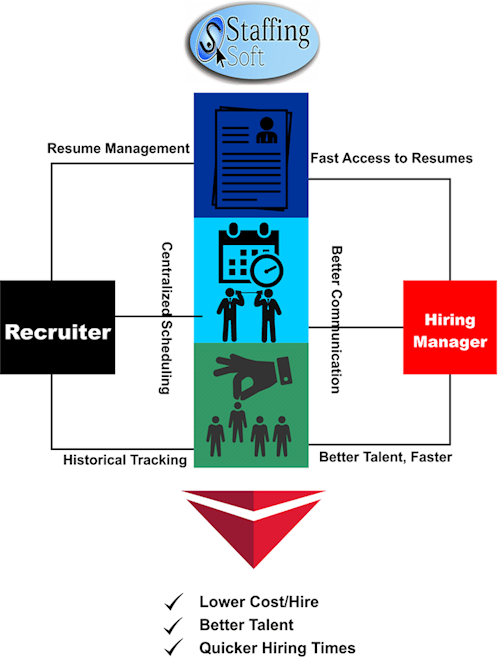 StaffingSoft provides companies of all sizes with a customizable framework to manage all of their hiring activities. StaffingSoft’s Staffing Software allows hiring executives to publicize job openings widely and almost immediately. The system can post the opening on thousands of Web sites, including general job-search sites, niche sites devoted to specific industries, and professional association sites. free or paid job boards. updates that are available to our clients free of charge. Unlike other ATS Systems available on the market. StaffingSoft is developed to be a comprehensive package that helps to improve everyday work flow in all aspect of business process from resume management, to job management, time management, report management, candidate management and client management. StaffingSoft system is a unique system in its complexity but at the same time simplified enough for all levels of professional to gain expertise of the system and its work flow in a very short time. Each module is completed with an online help index that will easily guide new users to gain control and understanding on all and each of the options available in the system. In addition, StaffingSoft online support team is available 24/7 to further assist users with their queries and questions. StaffingSoft is one of the most powerful recruiting software on the market today. With StaffingSoft Applicant Tracking System you will develop a more competitive intelligence and build solid relationships with your clientele. Discover how StaffingSoft Staffing Software will transform your current recruiting information into a valuable knowledge database by requesting for an online demo or contacting us direct!